One evening Nicky and his little sister Caroline were sitting in the meadow near their home at the edge of the forest. The sky overhead was like a cape of black silk encrusted with brilliant jewels. "How many stars are there in the sky, Nicky", Caroline asked. "Yes, I can see that, but how many?" she insisted. Nicky laughed. "Fine, you count them and tell me how many there are." "Let's see." Caroline stood up to be closer to the stars and began to count: "One, two, three, four, fi...Oh no, I already counted that one." "You see, silly," Nicky said, "you'll never be able to count them. Not even scientists with telescopes can." Caroline sat down again on the grass a bit disappointed. After a while she asked: "Nicky, what's a constalian?" "Constalian?" He looked at her frowning. "Oh, I know, you mean constellation." "Well, you said something else." "Of course I know what a constellation is," Nicky said. "What I don't know is what a constalian is." Caroline punched him on the shoulder. "You're mean". "Of course I am - like my constellation." Nicky smiled. "We all have a constellation. Even you have one." "What's a constellation? Please tell me, Nicky," Caroline pleaded. "They're like pictures formed by the stars. Look, there's mine - Aries." "Where?" his sister asked, standing up again. "What's an Aries?" "I don't see any ram," Caroline protested. "Do you see the three stars of the belt of Orion?" Her brother pointed at the sky. "They're called Las tres Marias in Spanish." Nicky was learning Spanish in school. "That's nicer than belt," his sister said. "Anyway, if you follow the line made by the Belt to the right and upward.." he traced an imaginary line in the sky with his finger "...you come to five stars that form an arc. Do you see it?" "Yes, I think so," Caroline exclaimed. "It really does look like a ram," the little girl smiled. "Now I know why you're so stubborn. What's my constellation?" "Yours is Pisces, but I don't know where it is. Anyway, a lot of people say it's only superstition, all that constellation stuff." Nicky sighed as though he were tired of his sister's eternal questions, but in reality he was pleased to show how much he knew for being three years older. "A superstition is something people believe is true, but isn't." "It's not true then?" Caroline asked, surprised. "I guess not, but I don't know." "What's Daddy's constellation?" Caroline asked. "Scorpio, that's a scorpion," Nicky said. "I think it's that one with the long tail." "Because it looks like a scorpion. Don't you see?" "Cancer. But I don't know where it is either." "But cancer is a sickness," Caroline protested. "No, it doesn't have anything to do with the sickness. It's a crab. They're all animals, you see." "More?" Nicky smiled. "There are a lot more, but only twelve are in the...Zodiac, I think it's called. "It's like a belt made of stars up there in the sky," Nicky answered before she could finish. "We all have one of the constellations of the Zodiac according to our birthday." "How nice!" Caroline said. "What are the rest of the constellations called?" "I don't know," the boy said. "I used to know but I forgot. Anyway, it's not important if it's a superstition." Caroline became pensive without saying anything for a long time - a long time for her, that is. "Nicky," she finally exclaimed, "I bet the Star-man knows all the names and where they are." "Yes," Nicky agreed, "he probably does." "Did someone call me?" a deep voice from the forest called out. They jumped up and looked behind them. And there was the Star-Man in person, a little man no taller than Nicky, emerging from the forest and walking towards them. He wore a white tunic with a gold-colored six-pointed star on his chest. The children were very happy to see him again and all three faces shined with big smiles. "How good that you've come!" Caroline exclaimed. "I bet you know the names of the constellations and where to find them." "Of course I do," the little man said. "Can you show them to us? Nicky doesn't know them all." "With pleasure." He put his two pinkies in his mouth and whistled sharply three times. Imagine the children's surprise when a reddish horse with white wings appeared from the sky. "You called me?" the horse asked the little man. "Yes, Pegasus. My two little friends would like to visit the constellations," he answered and, addressing the children, said: "Pegasus is also a constellation." "All of them?" Pegasus said, looking worried. "That would take too long. I think they're especially interested in the constellations of the Zodiac. Isn't that right, my friends?" "Yes sir, only the Zodiac," Nicky said, not at all sure that he wanted to visit any of the constellations. "Good," Pegasus nodded, "that will be easy. Get up on my back." "Thank you very much," the little man said to Pegasus. "Come, Caroline, I'll help you mount." Caroline put her foot in Star-Man's hands and he lifted her up to the horses back as though she were a feather. Then came Nicky's turn, who sat in front of his sister. She held onto his waist. "Ready?" the winged horse asked. "Ready," the little man answered for them and the winged horse took off. "Which constellation do you want to visit first?" he asked them once they were flying over the clouds. "A..A..Aries," Nicky answered. At first he was afraid, but little by little he realized that traveling on Pegasus' back was quite comfortable, not at all like galloping on the earth. "Very well," Pegasus said without much enthusiasm. "Let's hope he's not in a bad mood today. Close you eyes, children, we're going to fly fast now. Several minutes later they landed on a meadow covered with flowers and the two passengers dismounted. "Where are we?" Nicky asked. "In the constellation of Aries of course," Pegasus told him. "Look, there he is!" "Aries." Pegasus pointed with a hoof to a hill on which a huge ram was staring at them with angry red eyes. Suddenly he kicked with his back hoofs and ran swiftly towards a rock. Instead of stopping when he reached it, he butted it with his curved horns and smashed it into a thousand pieces. "I don't think he's in a very good mood," Caroline murmured. "Oh, that's nothing, Pegasus said. "He's only playing. Well, do you want to wait here until the other constellations arrive?" "Yes, it's very pleasant here, forests, rivers, mountains and many stars." "How long would we have to wait?" "One constellation a month," Pegasus answered. "There are twelve." "One year! Oh no, we can't wait, we have to go to school and..."
"And mommy and Daddy would be worried," Caroline added. The winged horse sighed. "Very well, I'll take you to the other constellations, but we must hurry because I have to be back in my position before some astronomer realizes that I'm gone and makes a scandal." "Why a scandal?" Nicky asked. "How should I know...they'll say it's the end of the world or something." "Do you have your own constellation, Mr. Pegasus?" Caroline asked him. "Of course, child," the horse answered somewhat offended. "I'm Pegasus." "Will we visit your constellation then?" "No, we only have time to visit the constellations of the Zodiac, and I'm not one of them." Then Caroline asked him why each person has his or her own constellation. "It's a manner of speaking," Pegasus said. "Before being born everyone passes through one of the constellations on their journey through the stars from heaven to their mother's belly. In passing through, they acquire some of the characteristics of the constellation." "Then Nicky is like a ram?" "Maybe a little. Or isn't it so?" "A lot more than a little," the girl said. "But Nicky is a good boy." "I'm sure he is, and strong...Now, ready?" Without waiting for a reply he took off from Aries. They flew through the stars until Pegasus yelled, "Hold on, we're going down!" They landed in a field of yellow grass in which a bull twice the size of Aries was grazing. Upon noting that someone was in his pasture, he raised his head, blinked three times, decided that the visit wasn't that interesting, and continued to graze. "A bull!" Caroline said. "Is he dangerous?" "Oh no. Taurus is a gentleman. He only gets angry if you bother him a lot. Then he can be dangerous." Without dismounting, they watched Taurus for a while, but the bull never even raised his head again. They found the next constellation in the middle of a sunny forest. The two children were very surprised to see two other children dancing together in a clearing and playing flutes. "Now we are in Gemini," the winged horse said. The children dismounted. "Who are those children?" Nicky asked. "Where's the Gemini?" Caroline added. "Gemini means twins," Pegasus explained, "and those two children are the twins.. Their names are Castor and Pollux, but I don't know which is which because they're identical." The twins stopped dancing when they saw our friends and one of them, Castor or Pollux, cried, "Look, we have visitors!" "And what visitors," the other one said. "Two children and a winged horse. It's a mystery." "Yes, a mystery, but we will solve it." "Surely we will. 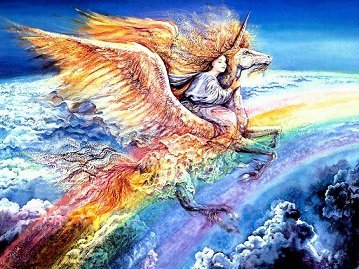 Look, that must be Pegasus, because he is a horse with wings, a constellation like us." "But not in the Zodiac." "And the others must be children from Earth because..."
"Because," the other twin interrupted, "The boy has his cap on backwards and the only place where they do such strange things is on Earth." "Correct. Mystery solved." They waved and returned to their dancing. "How smart they are," Caroline said. "But you told me that the constellations were all animals, Nicky." "Well, that's what I thought." "No, we're not all animals," Pegasus said. But the next one is an animal - and a very strange one." "They're all strange, " Nicky said. They landed on a beach. The sea's waves dashed onto the sand and covered the horse's hoofs. "Where's the animal?" Nicky asked. "I don't see any." "She's in the water. Let's wait for the next wave. She's very curious and is sure to come." The next wave deposited a crab at their feet. Its claws opened and closed in greeting. "Oh, it must be Cancer," Caroline said, "Mommy's constellation." "Yes," the crab confirmed in a low voice. "I'm Cancer and I love children. Would you like to go swimming?" "That's very kind of you, Madam," Pegasus said, "but we still have eight constellation to visit and I have to be back where I belong." "All right, put keep well covered, children, you don't want to catch cold," Cancer said and returned to the sea on the next returning wave. "How kind she is," Caroline commented as they flew on to the next constellation. This time the winged horse landed in a beautiful savanna. Gazelles and hares leaped away like the wind when they saw him. But an animal that was resting alongside a lagoon looked at them haughtily and roared so loudly that the children almost fell off Pegasus' back. "It's a lion!" Nicky cried. "Maybe we better leave." "No, King Leo is a friend," Pegasus smiled. "One must only show him respect. "Good Day, Your Majesty." "G'day," the lion growled softly. "We give you welcome." "We thank you, Your Majesty," Pegasus said. "I have come with these two children on a short visit to your kingdom. Now, with your permission, we will continue our journey." "You have our permission," King Leo answered. And he closed his eyes to continue his nap. Pegasus had to look for an open space to land in the constellation of Virgo, because almost the whole ground was covered by a wheat field. "Look!" Caroline cried, "a woman at last!" The most beautiful woman they had ever seen approached them. Her hair was blond and she carried a sheaf of wheat in her right arm and a wheat-colored cat followed her. "You are Pegasus, if I'm not mistaken, Virgo said. "But who are these two children?" "They're from Earth, friends of the Star-man." "Very well," the beautiful woman said coldly. "I don't have time to talk because I must organize the harvest." She turned around and disappeared into the Wheatfield. "She must be very busy," Caroline, who would have liked to talk to her a while, said. "She's always busy," Pegasus mumbled. He was offended and took off immediately. Our next host isn't like her, thank God." The winged horse was right; it was Libra. "Ah, my friend Pegasus," the pretty girl with black hair that fell to her shoulders exclaimed. "How kind of you to visit me! Welcome, you beautiful children." She carried weighing scales in her left hand. "What can I offer you? Herbal tea, perhaps? No, I'll bet that you children would prefer a glass of milk - or a soft drink? And a plate of oats for you, Pegasus?" Before they could answer, the girl looked at her scales and said, "Whoops, the right scale is low again. Do you have something light to put in the left scale?" Nicky and Caroline looked at each other. "I don't have anything," Nick said. "Wait!" his sister said. She untied the red ribbon that kept her hair in a ponytail and offered it to Libra. "It's silk", she said. Libra placed it on the left scale, which descended just a bit. She smiled and said, "Perfect, I thank you warmly, my dear. I would like to give you a gift as well." She took a clasp from one of her two long braids and gave it to Caroline. The child opened her eyes wide on seeing that it was in the form of a small scale made of gold. "Thank you very much," she said, and put it in the place where the ribbon had been. "Goodbye, my friends", Libra called. "Come to visit me more often. And don't be afraid of my neighbor, who won't harm you if you don't step on him." "Who is Libra's neighbor?" Nicky asked as they flew over a desert. "There he is," the winged horse said and they landed between two cactuses in bloom. "Where?" Caroline asked. "I don't see anything but sand and cactus." "Scorpio," Pegasus said. "Better not dismount because he's practically beneath my hoofs." The children looked down and saw a scorpion lift its poisonous tail towards them. It was the same color as the sand, which is why they hadn't seen him. "These children are from Earth," Pegasus said. "Friends of the Star-man." "I wonder why they didn't announce their visit previously," Scorpio said. "It...It's because we were in such a hurry," Pegasus answered nervously. "Perhaps you can help me," Scorpio replied, apparently satisfied with this excuse. "I'm building an underground canal to irrigate the desert." "We would gladly help you, but these children want to see the rest of the constellations and we don't have much time." "If you prefer to waste time in useless visits instead of taking part in a project of great importance for the universe," Scorpio said dryly, "I take my leave." And he disappeared. "Where did he go?" Caroline asked. "Who knows?" Pegasus said. "He's a strange constellation. Personally I prefer the next one." It wasn't difficult for the children to understand why Pegasus preferred Sagittarius to Scorpio. They had landed in a beautiful field full of green grasses and high, leafy trees. The owner of the constellation, Sagittarius, half man, half horse, galloped to meet them. "Hi, Pegasus", he said happily. "I haven't seen you in a long time. Have you finally decided to change into a half-man like me?" He pointed to the children and laughed. The winged horse also laughed. "No, my friend, these children will return to Earth today. So I can't be a half-man yet." "What a shame. Well, when you change your mind let me know and we'll find some stars to make up your upper body. Goodbye now, I'm off to hunt." And he galloped off with his bow and arrows ready to shoot. Capricorn the Goat never left off chewing during our friends' visit. He greeted then with a nod, but seemed to be thinking of something else - like eating. As they flew off to the next constellation they saw him climbing up a rocky mountain, slowly but surely. "Yes," Pegasus agreed. "He doesn't say much, but he's a good fellow." They landed next in the outskirts of a tropical city. A handsome young man seemed to be expecting them. He wore jeans and a blue shirt and carried a thermos bottle under his right arm. "You must be thirsty," he said to the children and poured water from the bottle into a cup, which he offered first to Nicky. It's water of the future." He looked at them closely. "The immediate future." Nicky took a sip and handed the cup to his sister. "Mmm, delicious," she said. "I'm glad you like it," Aquarius said. "You are the first Earthlings to taste it. May your future be happy. Now I must return to the fountain for more water. The bottle is almost empty." "Thank you, Aquarius," Nicky called as they took off. "Yes, thank you," Caroline repeated. Pegasus carried the children to the bank of a river and had them dismount. "Pisces will come soon," he said. Suddenly an enormous fish slid up the bank and opened its mouth. "Hello, Caroline. You don't remember me, but I remember very well that a few years ago you passed through my river just before you were born." "How do you do, Pisces", Caroline, who in fact didn't remember, said. "I thought on seeing you for the first time: "She will be a good girl and her brother, who earlier passed through another constellation, will help her to grow." "This is my brother, Nicky," Caroline said, blushing at her constellation's praise. "Please to meet you. Oops, the current is taking me away. Keep well, my dear." And the current carried her off. "We're finished, children," Pegasus said. "One year in one hour. I have never flown so rapidly. Now get ready to return to Earth." "Which is the Star-Man's constellation?" Nicky asked once they were mounted. "All of them," Pegasus answered. "The Star-Man is a special person." The children closed their eyes and when they opened them they were back in the meadow near their house. They dismounted and when they looked up to thank the winged horse, he had already disappeared. "He was in a big hurry to get back to his place in the sky," Caroline said. "But what a marvelous adventure he gave us!" "Yes," her brother agreed. "It was like a dream. I almost can't believe that it really happened. Everything here is just like it was before." Caroline lifted her hand to her head and took off the golden clasp that Libra had given her. She showed it to Nicky and they both knew that the journey to the stars on the winged horse's back had been real.